Make your own collage – NEW: 250 FREE templates! A photo collage is a little work of art made up of the most beautiful photos. And for all those of you who want to make your own collage, there’s good news. This website makes making your own photo collage a breeze. Even if you’ve never done it before, you can create your own collage online very simply. You can make your own collage in just a few clicks and print collage of photos. 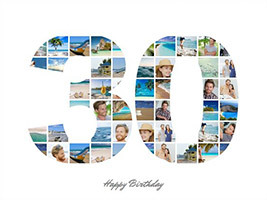 Tip: We offer more than 250 free photo collage templates, also for special occasions. Tip: Our customers love canvas. 65% of all collages are ordered on canvas. 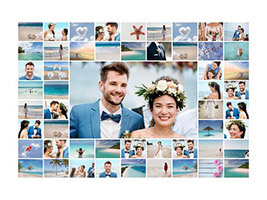 If you want to create your own collage, you will start by uploading the photos you want to use from your computer into the internet. This can take a few minutes, depending on your internet connection. Then nothing more stands in your way. 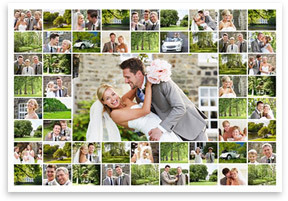 Once all of your photos have been uploaded, the program starts automatically with the creation of your photo collage. 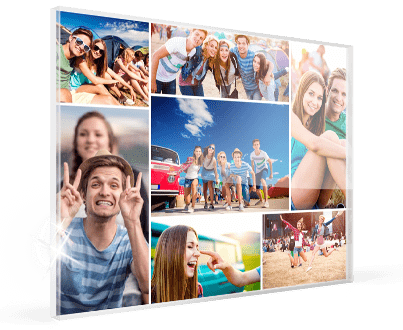 All photos are immediately inserted into the photo collage template you selected. Using this function saves you a huge amount of time and means that you don’t have to insert each photo one by one. This is particularly useful when you want to make your own collage using many photos. Select the pictures you want to use in your photo collage. 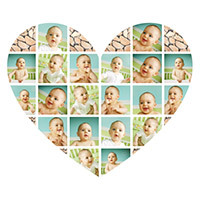 Upload these pictures into the photo collage template of your choice. You can now edit your photo collage by moving your photos around until you are happy with the arrangement. The photos can also be edited online. Done! Once you’re happy with collage, you can have it printed. Simply select the size and material you prefer and send your order. Delivery will take just a few days.